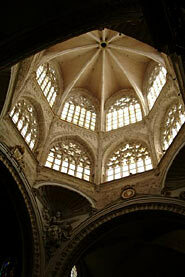 Saint Mary’s Cathedral of Valencia or just Valencia Cathedral was built over the site of a large Moorish mosque between the 13th century and the 15th century, which in turn had previously been a Visigothic cathedral. It’s plain to see the time that went into building the Valencia Cathedral from the variety of architectural elements present, as well as the amalgam of styles. However, of the three doors that this magnificent building has, the Romanesque one is the oldest. On this door you will find represented the seven husbands and the seven wives who undertook to bring -from Lerida to Valencia- seven hundred maidens to be the wives of the first Christian settlers. Every Thursday, the gothic “Puerta de los Apóstoles” (The Apostles’ Gate) of the Valencia Cathedral becomes the setting for the Water Tribunal, an institution that dates back to the Middle Ages. Declared Intangible Cultural Heritage of Humanity by UNESCO, this institution regulates the use of water to irrigate the fertile plains of the Region of Valencia. 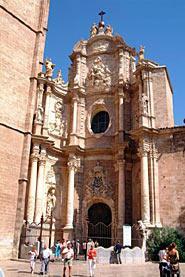 The Baroque “Puerta de los Hierros" (Iron Gate) is the main entrance to the Valencia Cathedral. And right next to the cathedral you will find the bell tower known as “El Miguelete”, which is considered to be one of the most emblematic symbols of the city of Valencia. Times: Lunes a Sábados de 10:00 a 18:30 h. Domingos de 14:00 a 18:30 h. Festivos de 14:00 a 18:30 h.